At the annual Britsch lecture, María Josefina Saldaña-Portillo discussed U.S. deportation policies and the rise in women refugees who are fleeing from their homes. PROVO, Utah (March 1, 2019)—BYU honors the Britsch family each year by inviting a distinguished scholar to lecture. 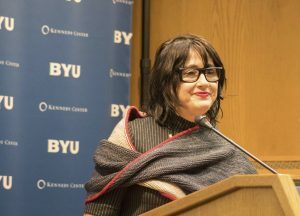 This year, BYU welcomed María Josefina Saldaña-Portillo, a Professor of Social and Cultural Analysis at New York University (NYU). She has been aptly called a scholar who blurs the lines between scholarship and activism. Dr. Saldaña-Portillo spoke strongly on U.S. deportation policies and what she sees as the best solution to overcoming the problems that can arise from deportation. As someone who works near the border with many women and children who are seeking asylum, she had much to share as to how the U.S. can better work with these refugees who are escaping from Mexico and South America. She noted how there has been a sharp rise of women trying to flee across the border, with many of them trying to escape criminal violence that’s initiated in their native countries. These women and children flee not only from the influence of corrupt governments and local gangs, but also for their lives as they try to find a safer environment to live and raise families. Dr. Saldaña-Portillo continued to discuss the gang violence that has quickly become a problem in some areas and pleaded for a change in U.S. policies to allow these women and children to escape their harsh conditions. Many women who wish to come to the United States have a hard time not only getting to the border itself, but even gaining access to the U.S. once they get there—something that Dr. Maria hopes can change in the future. While being wary of the impact of the country’s involvement in these neighboring countries, she hopes that the U.S. can make changes within their own policies to achieve the future that she sees.